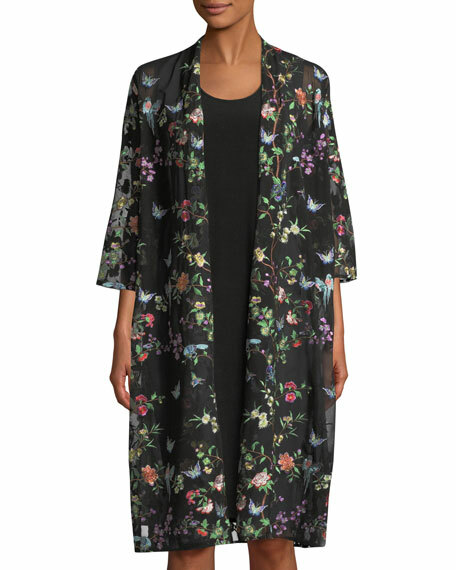 Caroline Rose "Fluttering Floral" duster with colorful embroidery. Straight hem; side slits for ease of movement. For in-store inquiries, use sku #2561355. Akris punto "Elements" shirt in cotton sateen with tonal seam details throughout. Approx. 29"L down center back. Spread collar frames split neckline. Three-quarter kimono sleeves. Shirttail hem. Cotton; dry clean. Made in Romania. Model's measurements: Height 5'10"/177cm, bust 33"/84cm, waist 25.6"/65.2cm, hips 35.8"/91cm, dress size US 2-4/FR 34-36. Forte Forte silk satin kimono in Italian Riviera floral print. Open front; detachable self-tie belt. Long sleeves. Relaxed fit. Mid-thigh length. Acetate/viscose, collar detail. Cotton/viscose/acetate/nylon, cuff details. Acetate/viscose lining. Made in Italy. Model's measurements: Height 5'10"/177cm, bust 32"/81cm, waist 24"/61cm, hips 35"/89cm, dress size US 2/4. 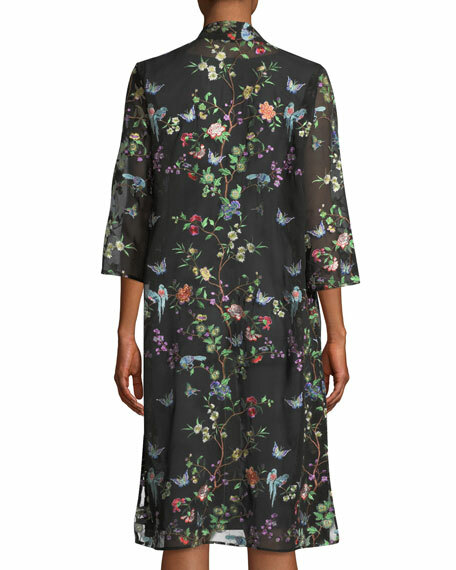 Johnny Was "Elijah" floral-embroidered georgette kimono. Open front with self-ties. Half sleeves. Relaxed fit. Below-hip hem. Rayon. Machine wash. Imported. Johnny Was "Elijah" floral-embroidered georgette kimono. Open front with self-ties. Half sleeves. Relaxed fit. Below-hip hem. Rayon. Machine wash. Imported. Please note: This merchandise may have a distressed effect. It is a unique feature that enhances the product and is not considered a defect. Johnny Was "Ember" kimono in floral-printed velvet with floral embroidery trim. Shawl collar. Open front. Three-quarter kimono sleeves. Arched hem. Johnny Was "Ember" kimono in floral-printed velvet with floral embroidery trim. Shawl collar. Open front. Three-quarter kimono sleeves. Arched hem. Rayon/silk. Dry clean. Imported. Please note: This merchandise may have a distressed effect. It is a unique feature that enhances the product and is not considered a defect.